Full Capitol Couture Site Viral Site Launches for Lionsgate's Adaption of 'THE HUNGER GAMES'! 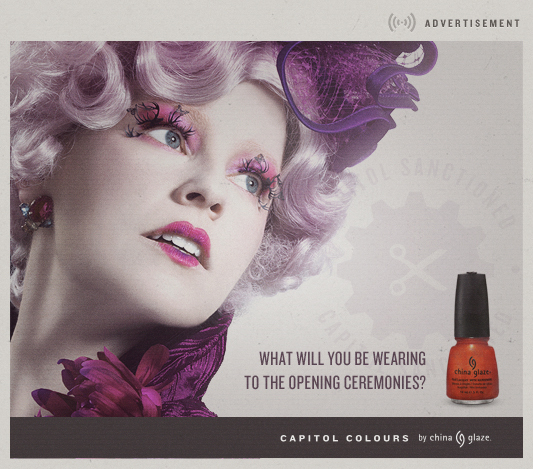 A viral site in for The Hunger Games launched last week & today the site has expanded its content offering fashion tips from the world of Panem, including a profile article on Effie Trinket [Elizabeth Banks]. Head over to CapitolCouture.pn. Based on the hugely successful book series by Suzanne Collins, The Hunger Games stars Jennifer Lawrence, Josh Hutcherson, Liam Hemsworth, Wes Bentley, Stanley Tucci, Woody Harrelson, Lenny Kravitz, Toby Jones, Donald Sutherland & many more. The adaption hits theaters March 23rd. I'm reading: Full Capitol Couture Site Viral Site Launches for Lionsgate's Adaption of 'THE HUNGER GAMES'!Tweet this!